Ah, the glorious Stars and Stripes, stroking that flagpole vigorously in time with your amorous applause. This is Americlap, the spirit of patriotism is one intentionally stupid game. 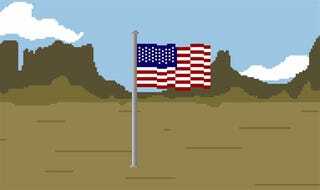 Americlap is a free game that utilizes your microphone to capture your clapping, which keeps the American flag from falling to the ground. "It's short and stupid but I love getting people to embarrass themselves playing it," indie developer Chris Bulch told Eurogamer of his creation. He likens it to Desert Bus, Penn and Teller's non-game about driving a bus through the desert, where nothing happens. Except things do happen in Americlap. Hulk Hogan's WWF intro music plays and then our love for America is put to the test. If that's short, stupid and embarrassing, then all of America is short, stupid and embarrassing, and that doesn't make any sense at all. Some of us are quite tall. You can grab Americlap for free right here. Non-Americans are free to watch someone suitable play it below.